I have to admit that I really, really, enjoy reading fairy tales. Yesterday, my mother found an old tattered illustrated book (or what was left of it) of fairy tales in a box. The book had no cover (I am not sure what happened to it) and the frayed and curled edges barely held the pages together. It was obviously well-read, if not so well taken care of. I think (though without the cover, I can’t say for sure) that it was Mother Goose’s Fairy Tales, since it included Little Red Riding Hood and Cinderella. This was the sanitized version of the tales, naturally. I wasn’t reading the Grimm brothers’ original tales as a child. These were tales from far-off lands, of princes and poor girls who found unlikely love, vanquished dragons and lived happily ever after. Wait a minute, did I just describe every romance novel ever written? Let’s see. We have the main protagonist—a young, incredibly beautiful woman battling peculiar odds and seeking happiness (though she doesn’t always know it)—like Cinders and Sleeping Beauty. We have a charming Prince who, while he’s a leading character who will eventually rescue the heroine, doesn’t have a major role in the story unless it’s in connection to her. We have evil stepmothers/stepsisters (read jealous ex-wife, ex-girlfriend or meddling mother-in-law) who do everything they can to drive a wedge between the leading lady and her one true love. We have friendly souls who only wish the best for the heroine and help the lovers come together (the best friends, the romantically-inclined aunt or grandmother). And we have a dash of magic—the universe conspiring to connect these two lovers—that lights the spark, like the kiss that wakes up Sleeping Beauty or turns the frog into a prince. This isn’t a new thesis. People have been comparing modern-day romances to fairy tales for decades now. In fact, the biggest criticism of romances has always been that they create unrealistic expectations in women who read them. Are we measuring every man we meet against our own Prince Charmings? Are we dreaming of castles and white knights, of seven little men who will wait on us hand and foot while we wait patiently for our hero? Which begs the question, are little boys forever seeking the most beautiful woman in the land for their bride, ready to ride high and low and across the world to find the woman with the prettiest foot that fits the glass slipper? I wonder about ‘false expectations’ we should be on the look out for if our romance novels were modelled on Grimm’s original fairy tales. Do the critics of the romance novel worry about stories where a mother urges her daughter to cut off her big toe in order to cram her foot into a golden slipper (in the original Brothers Grimm tale, Cinderella wears golden slippers)? Or where a thieving husband readily gives away his firstborn to a wicked enchantress in order to save his own life? Do they worry that parents will be instantly driven to save themselves over their children, leading them into forests and leaving them to fend for themselves, if they read too many stories like Hansel and Gretel? I haven’t read all of Grimm’s original tales, but the one that stood out as being the most altered was Rapunzel. Unlike the Disney take in Tangled, Grimms’ tale is a vicious little story of a 14-year-old girl trapped in a tower. Her prince, when he comes, impregnates Rapunzel, sneaking into the tower at every opportunity. When the wicked enchantress finds out (through a stupid slip of Rapunzel’s tongue—“tell me, dame gothel, how it happens that you are so much heavier for me to draw up than the young king’s son”), she banishes the girl to a desert, ‘where she had to live in great grief and misery’. The prince, tricked by the enchantress to climb the tower, leaps out of it in order to save his life and falls into a bed of thorns. The thorns pierce his eyes, blinding him and leaving to roam the world in despair. He does, in time, find Rapunzel, who is raising twins, a boy and a girl, in complete ‘wretchedness’ in the desert. And they do return to the prince’s kingdom to live happily ever after together. The enchantress, however, lives on. She isn’t vanquished by the prince (quite the contrary). And Rapunzel isn’t a long-lost princess whose parents are pining away for their first-born. Her father, in fact, got her into the mess by stealing rare rampion that his depressed wife desperately craved from the enchantress’ garden. When he was caught, he readily acquiesced to paying for the rampion with a child. More than the obvious violence in these tales is the underlying callousness of human beings, parents in particular. In the original Cinderella, her ‘kind’ father is as much to blame for Cinderella’s plight as her stepsisters. 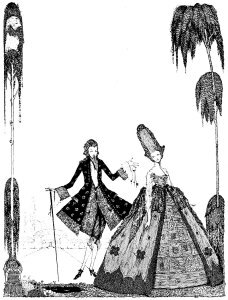 When the prince comes seeking the mystery woman belonging to the golden slipper, Cinderella’s father describes her as a ‘stunted kitchen-wench which my late wife left behind her’. The miller’s daughter in Rumpelstiltskin faces death because her father, in an effort to make himself appear valuable to the king, lays false claim to her ability to spin straw into gold. And despite the clear evidence of the King’s greed, the girl’s fate (her happiness at becoming queen, perhaps?) is tied to his in marriage. I have never read a modern version of Rapunzel that portrays her parents as anything except deeply saddened at the loss of their daughter. Several, in fact, suggest that they were desperate to get her back. Cinderella’s father was always clueless and distant, never in total agreement with the evil stepmother in any 20th century story I have read. The more of the original Grimm tales that I read, the more I wonder at the mind that thought these were good tales for children. Or how they turned from homilies on the evil of mankind to stories of love, beautiful women, charming princes and fairy magic. It seems to be a pretty wide leap, a centuries-old game of Chinese Whispers that has stripped the darkness from the folklore. Children, however, grow up. It’s easy to find the original tales. Fairy tales are no longer fairy tales, but fantastically grim twists on something we associate with Disney songs. This generation isn’t shivering at the thought of Smaug in his mountain, instead it’s dreaming of owning, as pets, Drogon, Viserion and Rhaegal. This generation is watching the (yet more) revisions of their fairy tales on TV (Once Upon a Time) and in the movies (Snow White and the Huntsman) and cheering on the grimy Huntsman in favour of a prince. This generation has already eschewed the sanitized versions of Disney’s Snow White for a sword-wielding warrior. It seems that the only real fairy tales left anymore are the ones we find in romance novels. The only question is, how soon before they, too, embrace the darkness? Natasha Ahmed is the author of 'Butterfly Season', a romance novella about a Pakistani woman who dares to go against her culture and traditions. Butterfly Season is available on Amazon, Smashwords and on Indireads.